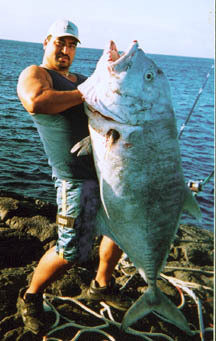 Holi Correa was fishing on the Ka'u Coast of the Big Island of Hawaii when he hooked a monster fish. Holi battled his behemoth using a Jeff Andrews pole measuring 14 feet 7 inches in length and a 113HLW Penn reel. The 134-lb giant trevally tested Holi's 80-lb test Ande line to its limit but Holi's skillful angling prevailed. Holi's catch was even more impressive when it was discovered that it was the largest ulua ever caught by a Hilo Casting Club member. Becoming an HFN 110-Plus Club member and catching an HCC record is a major achievement! Congratulations, Holi!